Free File Label Software comes with every order on File Label Express! Are you are using a complex color coded system on end tab file folders? A simple text label on your top tab folders in drawers or cabinets? Get our Free File Label Software today. File Label Express can save you time, money and effort. We can match any file system, including any custom system you have. Some examples of custom labels are below, these are just samples, we can do anything with any label! While File Label Express Excels at End Tab Color Coding it is as fast and efficient in creating simple 1/3 cut top tab file labels as well. 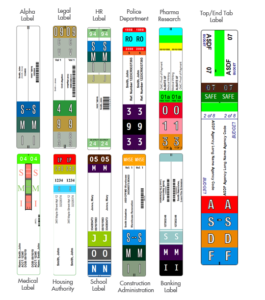 We can match any color code system on the market. If you are using a current computer generated label, File Label Express can not only make your label, but store your data. That’s right, we make the label and capture your data entry for future use! Are you using traditional top tab filing? File Label Express can merge a standard text label with a color code on its custom tab fold over label to differentiate files based on any criteria. That’s right, enter data once and create a front and back label for your top tabs! And data entry is a snap! Do you have file classifications you use all of the time? We can turn those into a drop down or select menu. Do you need a checkbox to determine data entered to a file label, no problem. Dates? File Label Express has date pickers to create uniform data entry values. If you only creating single labels at a time, File Label Express has a simple form that opens as modal over the main screen. All of your select menus, drop downs or multiple select choices are fully enabled here. This simple to use interface will get your entire staff working immediately with your label designs to create professional top quality labels for your files. 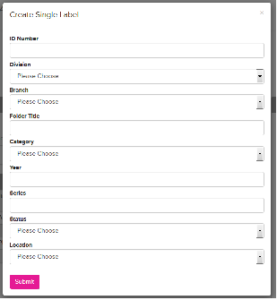 Simply enter the data, let the form validation do its work and your label is ready to print. Are you creating multiple files at once? File Label Express provides a spreadsheet user interface with all menu devices enabled to speed you and your staff through the creation of scores of files in the same view. 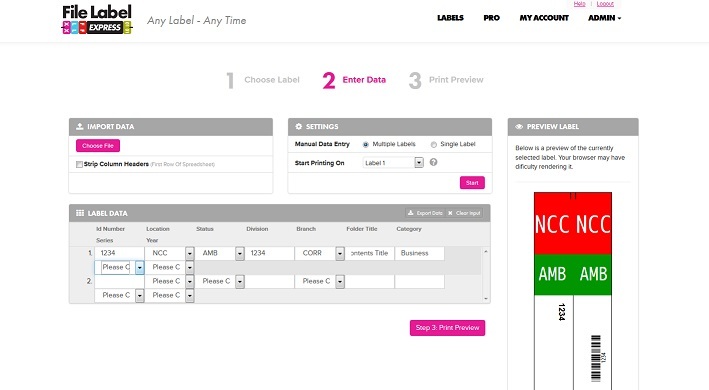 Enter your data, tab through and verify, then preview your labels and print. It couldn’t be easier! 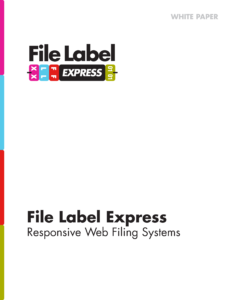 File Label Express can create any type of label for any type of file or filing system. But it doesn’t end there! Think of all of the files you create and what you do with them, today, tomorrow and in the future. If you are eventually going to store files, File Label Express captures every key stroke you made in creating them. Those then become detailed listings for archive boxes, or export data for scanning conversions. Or, you can turn on File Label Express advanced Records Management Features and check those in and out or assign them to associates. Making the label is only the start. And you can start today!